2015 is not going to be a high-mileage year. Friday night I went to pick up pizza, 5 days later I’m on the couch with extremely limited mobility. I was just walking along, going for pizza as any 72 year old man might do. As I entered the Little Caesar’s carb factory, did I trip, did my Achilles Tendon give way on its own? I don’t know. Maybe a little of each. The fall kind of hurt, at least my hip did. My left foot didn’t feel much of anything but there was something not right about it. 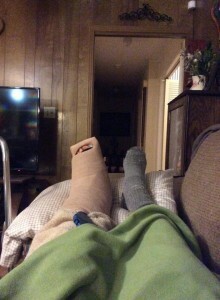 I could walk on my heel and could flex the foot, didn’t seem broken, but the tendon was, call it sloppy. I took the pizza home, enjoyed a couple of pieces and eventually went to the emergency room, not really wanting a sloppy tendon for the rest of my life. (I’ve been to the emergency room before and knew it was going to be a while. I didn’t let Jeanne go with me as she was hardly walking.) I was there for 4 hours before I saw a doctor. He recommended I make an appointment to see a specialist come Monday. Email would have worked just fine for that, and would have been a lot faster. I overheard a woman out in the hall say, “I’ve been here 5 hours and I’m bleeding. I’m going somewhere else.” Well, it was Friday night. Since we have the best medical care in the world people in other countries must just shoot themselves when they get hurt.I got home about 3:15 A.M. Went straight to bed because I promised Kurt I’d take him to Comic-Con in New Orleans Saturday morning. He said I could cancel but he had been looking forward to it and it was his birthday gift and he is such a nice guy and I was going to take him on one leg if it had to be that way, floppy tendon or not. You won’t believe how long the line was to get in, or how far I had to limp from where we parked. The cane didn’t really help as the parking lot had a layer of gravel, which was a little tough on my left heel (you know, the one I have to walk on instead of my whole foot). I thought about telling people I was cos-playing the walking dead but didn’t. I don’t think the walking dead use canes. I did tell that I was cos-playing an old man. So, the trip was 2 hours down, 2 hours back, that’s 4, 2 hours sitting on a bench (getting cold every time someone opened the nearby door to come in) and one hour resting in the car. I didn’t want to go onto the convention floor because I didn’t want to expose myself to the people who would still go to Comic-Con even when sick, i.e. anyone that was sick and a fan. So, overall it was 7.5 hours invested by the time we got home. I was really dragging, although only one foot. While driving I drank two 5-hour energy drinks and a travel thermos of coffee to stay alert. Although I was unbelievably tired when we got home my brain would not shut down and I couldn’t go to sleep until after 1:00 A.M.
That was then and this is today, the warmest, driest day, best riding day we’ve had in a while but, needless to say, I didn’t go for a bike ride. I know, excuses, excuses. Comments Off on Tis but a flesh wound.